In the decade following the Good Friday Agreement (1998), dissident Irish Republicanism has survived as an ideology, a form of politics, and violent action. This collection of essays by researchers and experts on the Northern Ireland conflict aims to explore the political and psychological context to the current rise of violence by dissident Irish Republicans and the danger dissident activities present to the peace process. 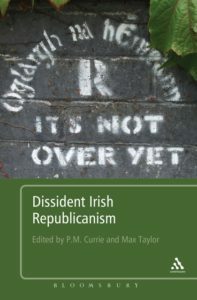 Dissident Irish Republicanism looks at why and how people become dissidents Republicans, the patterns of mobilization and recruitment of violent dissidents, the threat they represent, the evolution of the Real and Continuing IRAs. Together, the chapters provide coherent a perspective on how republican ideology has expressed itself, psychologically and politically, and is continuing to do so. This unique contribution establishes what is dissident republicanism, how it is evolving, and looks at its possible future. It will be an essential resource for anyone studying Northern Ireland politics, conflict processes, as well as groups that remain outside of peace agreements.